Some commutes just got a lot longer for drivers going through North Carolina. GREENSBORO, N.C. (WFMY) - The North Carolina Department of Transportation wants drivers to completely avoid several major roads in the eastern part of the state if they can after Florence, even if it means adding several extra hours to commutes. On Sunday, there were over 150 primary roads in the state are closed with conditions worsening. The NCDOT is asking people driving through the east coast to take a long detour around the state, using Interstate 64 West in Virginia to Interstate 81 south, to Interstate 75 south in Tennessee to Interstate 16 east in Georgia back to Interstate 95. Traffic from I-95 in Georgia is advised to use I-16 West to I-75 North to I-81 North to I-64 East back to I-95 in Virginia. A detour provided by the North Carolina DOT asks drivers not to go through the state. The NCDOT said travel is hazardous on all roads south of US 64 and east of Interstate 73/74. The NCDOT asks no one drive in this area due to the uncertainty of flooding. 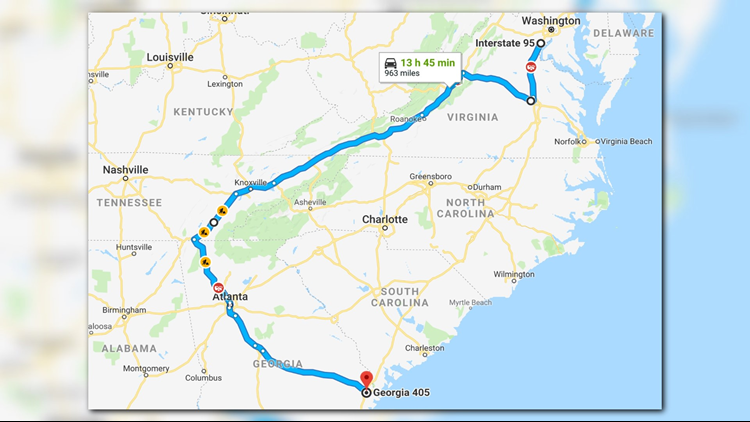 If you are already in North Carolina on I-95 you can use US 64 west to Interstate 540 west to I-40 west to Interstate 85 south into South Carolina. I-95 South is closed from Exit 65 in Godwin to Exit 464 in Rocky Mount and in Lumberton from mile marker 19 to Exit 22. I-40 Closed between Wilmington and Exit 390 (US 117) in Burgaw.